This week, several of the bankers, lobbyists, bureaucrats, djinns, wraiths, and wendigos that have formed the core of the U.S. foreign policy establishment over the last few decades expressed their indignation over the refusal of Donald Trump to drop out of the presidential campaign. Despite a letter exposing “male terror” by a bald-pated Rose McGowan, the man just won’t budge and hand the nomination over to a person with a human-sized cranium, or even recent cuckservative patsy candidate Evan McMullin. To kick off the latest round of fist shaking and jowl-flapping indignation against Trump, (((Richard Haass))), former Sol Linowitz professor at Hamilton College and current president of the Council on Foreign Relations, penned an article for the Wall Street Journal titled “The Isolationist Temptation” this week. Haass previously served on the National Security Council for the George H. Bush administration and received a Presidential Citizens Medal for “helping to develop and explain U.S. policy” for the interventions of Operations Desert Shield and Desert Storm in 1990 and 1991 after the Iraqi incursion into Kuwait, eight days after U.S. Ambassador to Iraq April Glaspie appeared to greenlight Iraq’s actions. The Council on Foreign Relations is a highly influential think tank and publisher of Foreign Affairs, and is based in New York, the home of traditional, wholesome, small-town American sentiments. Seemingly designed to enrage Alex Jones into permanent super-saiyan mode, current and former globalists at the Council of Foreign Relations include Haass’s co-religionists Robert Rubin, David Rubenstein, Laurence Fink, Stephen Friedman, Ruth Porat, Martin Feldstein, Madeline Albright, and Maurice Greenberg, among various other shabbos goyim and…Fareed Zakaria. The CFR is so cartoonishly filled with elite businessmen, media figures, and world leaders, and so simultaneously shadowy and meddling, that it seems to been fashioned in response to the global threat to stability posed by the Super Friends. As you might have guessed from the title, Haass’s article bemoans the “isolationist” tendencies unleashed among the U.S. populace by the Trump and Bernie Sanders campaigns. Rather than the Korean Yi Dynasty or Japanese Tokugawa Shogunate’s “sakoku” policy of actual isolationism for centuries, Haass defines isolationism by conflating it with non-interventionism, an old tactic of interventionists seeking to portray their opposition as provincial rubes afraid of the world around them. While simultaneously condemning the birth of American imperialism in the late 19th and early 20th centuries as seen in the annexation of Hawaii, the Spanish-American War, and interventions in Central America on behalf of certain interests, academics and foreign policy experts routinely assail America’s history of “isolationism” in the 20th century. In 1916 and 1940, Woodrow Wilson and Franklin Delano Roosevelt ran for reelection mouthing support for such a traditional American policy of avoiding European conflicts, following the famed advice of George Washington and John Quincy Adams, before coming to their senses right after reelection and listening to Felix Frankfurter, Louis Brandeis, Rabbi Stephen Wise, and other advisors whose thinking was more in line with Theodore Kauffman. Isolationists must not prevail in this new debate over foreign-policy fundamentals, one which I had never imagined would take place in my lifetime. Turning away from global engagement would mean not just opportunities lost: in jobs reliant on exports, the chance to invest overseas, the ability to travel without fear. It also would bring conflict and nuclear proliferation. As the world unraveled, Americans would be more vulnerable to terrorism, illegal immigration, climate change and disease. We do not have the option of becoming a giant gated community. Despite the constant association of interventionism in the Middle East and on Russia’s doorstep with “spreading democracy” and other spurious justifications, the American public is increasingly skeptical of the benefits of foreign military interventions insisted upon by various human rights commissions and global elites. Trump’s skepticism of the economic benefits of free trade, his tendencies toward America-centric foreign policy, and the sudden receptivity of the American public toward nationalism over internationalism have left the CFR President sputtering spooky warnings of “terrorism, global warming, and illegal immigration.” He declines to mention the role that interventions through airstrikes in Libya and Syria, population growth due to food aid and disease-eradication campaigns in Africa, and American involvement in destabilization of the Middle East after the Arab Spring have played in exacerbating those problems (some grave, some more…theoretical), not to mention a Council on Foreign Relations task force’s support of the DREAM Act. Haass pays lip service to the doctrine of realism, with its traditional emphasis on balance of power and willingness to work with sometimes unsavory regimes to prevent the more unsavory outcome of general war. He ignores, however, that its most famous 20th century theorist, George Kennan, steadfastly refused to support “containment” interventionism outside of America’s actual vital interests among industrialized allies in Western Europe, East Asia, and resource-rich areas within America’s sphere of influence. With the goal of the world as their playground, CFR types have steadily expanded this definition of vital interests by expanding alliances, often at America’s expense, justifying any and all projections of American power at any time, anywhere. In the face of all this “intervention fatigue” and “New Isolationism,” Haass writes that the solution for the American public’s recalcitrance in the face of interventionism and its ill effects is yet more interventionism, claiming “The Middle East is arguably the most salient example of what happens when the U.S. pulls back.” Appearing on MSNBC’s Morning Joe to complement his article, Haass described Obama as a “retrenchment president” who has destabilized the Middle East because of “what we have done in Iraq, what we haven’t done in Syria…,” both of which would he claims would have been fixed by continuing American interventionism in Iraq, and stepping up intervention in Syria by arming so-called “moderate rebels.” He also laments “Trump’s rhetoric about Allies” despite the CFR’s supposed apolitical, bipartisan bent. Not once, in his article or his tv appearances, does Haass explain in any detail how or why further foreign adventurism should be accepted by the American people, how it would benefit the American people, or where or how he suggests employing American forces. The key is to merely associate this new brand of “isolationism” with the supposed lessons of the Munich Conference, at which Neville Chamberlain apparently should have simply declared war over Hitler’s designs on returning Sudeten Germans to Germany. A “closed” society, meaning a non-interventionist one by Haass’s standards, is one in which jobs will decline, trade will plummet, global warming will rise, and global stability will unravel…more than it has already unraveled due to interventionism. Just as Haass’s co-religionist Walt Rostow promised for what became the Vietnam War, or Richard Perle promised for the “cakewalk” in Iraq, Haass plays up the need to go abroad in search of monsters to destroy, while downplaying the sacrifices necessary to complete conflicts which are always more complex and difficult to solve than are initially portrayed to the American public. Haass knows he can get away with statements like “Why do we think a place like Saudi Arabia, that still produces more than 10% of the world’s oil, is somehow immune from instability that is linked either to Syria or Iraq,” because he knows that the House of Saud doubled down on “stabilizing itself” by supporting for hardline conservative ulema scholars after the seizure of the Grand Mosque in 1979, he knows the instability in Syria and Iraq have been exacerbated or provoked by meddling in each country’s affairs, and he knows that the House of Saud’s rule is secure so long as figures like Prince Bandar bin Sultan continue to rival the Israel lobby in influence within the beltway. He also knows that, like George Soros, he can sell “open societies” to a public barely aware of these past events or current foreign affairs, and rarely able to take an informed or nuanced view of them. That’s why he can treat the world’s number one funder of Wahhabism as a country threatened by instability, which somehow necessitates action elsewhere. 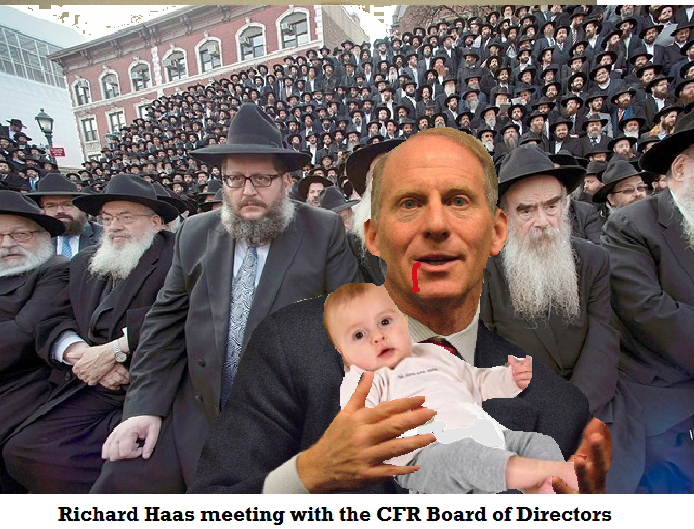 With his coterie of bankers, media pundits, generals, and past government officials, Haass wants to sell the same openness to the American public in foreign policy as he does for its borders. By doing so, American power can be utilized to open up the “closed” and “isolationist” governments in Russia and Iran to global finance and pozz to break down those countries’ traditions and resistance to working, as Henry Kissinger often puts it, “within the international system,” as Russia did when Jeffrey Sachs, Larry Summers, and other Harvard economists helped “open it up” with the IMF’s “shock therapy” plan that just helped to land its resources in the hands of a small band of international swindlers. With chutzpah characteristic of his people, Haass concludes “When the world begins to unravel, it doesn’t just stay there. It comes here.” The world did not unravel when the Tokugawa shoguns expelled foreign weapons, foreign religion, and foreigners, and the world didn’t “come there” for two and a half centuries, until Commodore Perry landed on Japan’s shores to open up its markets with the Treaty of Kanegawa the following year. When the world unravels, and borders fly open to accept the human invasions that accompany our “international system,” it’s because so many people like Haass have been working overtime to ensure that precisely this scenario plays out. When a group of former foreign policy advisors signed a letter against Trump on March 2, 2016, it came a day after Mitt Romney and John McCain reentered the public conscience to make similarly spooky predictions if the American people continued to support Donald Trump. The close coordination of these efforts was matched by events this week, when Haas’s article came at the same time that former CIA head Michael Hayden claimed the military might disobey Trump if he became president, and many of those same officials who signed the former letter joined with new signatories to write yet another jowl-shaking letter expressing outrage at the prospect of a Trump presidency. The campaign to issue another sternly worded letter while the public yawns was driven largely by Andrew Weinstein, who formerly served as director of media relations for Bob Dole’s presidential run in 1996, and wrote that Trump’s outrages “have built on his campaign of anger and exclusion, during which he has mocked and offended millions of voters, including the disabled, women, Muslims, immigrants, and minorities.” Weinstein was joined by his co-religionists in signing the letter at a clip of 1,650% over-representation, including Bush 43-era police state and ZOG clowns like Eliot Cohen and Michael Chertoff. Mr. Trump has demonstrated repeatedly that he has little understanding of America’s vital national interests, its complex diplomatic challenges, its indispensable alliances, and the democratic values on which U.S. foreign policy must be based. At the same time, he persistently compliments our adversaries and threatens our allies and friends…He has alarmed our allies with his erratic behavior. In our experience, a President must be willing to listen to his advisers and department heads; must encourage consideration of conflicting views; and must acknowledge errors and learn from them. To a public that doesn’t know any better, these words might sound alarming and discrediting to Trump’s credentials for leading the Departments of Defense and State. That seems to be understood by the letter’s writers, who rely on all shock and no substance. The signers certainly took no pains to discuss which organizations they were writing on behalf of, why none of our alliance deals can be renegotiated, or why Trump would “compliment our adversaries” and “threaten our allies” for no apparent reason. When Chairman of the Joint Chiefs of Staff Martin Dempsey and some members of the military brass began to chafe at Obama’s decision to arm “moderate rebels” in Syria and move closer to Turkey, Obama replaced Dempsey with the empty suit Joseph Dunford, a “yes man” more than willing to toe the line for Obama by shifting Dempsey’s focus on ISIS to suddenly claiming Russia was the number one threat to America. These cornerstones of U.S. foreign policy are essentially reprimanding Trump for threatening their cozy consulting jobs pushing endless interventionism within the security establishment, not unlike how National Review writers just might find their fake opposition jobs in peril if the GOPe loses and Trump wins. In Hillary, they see their own Dunford, a compromised woman that will understand who put her in power and act accordingly. All of these figures are accustomed to making halfhearted statements to the public every four years to keep the gravy train rolling, and must be genuinely alarmed at an unexpected outsider threatening to break up the network. Just as Barry Goldwater was maligned in the 1964 presidential election for “racism,” and associated with nuclear holocaust for being less than enthusiastic toward escalation in Vietnam, the Civil Rights Act, the Hart-Celler Act, and what became the Great Society, Trump becomes the “madman” who can’t be trusted with our nuclear stockpile, and certainly can’t be trusted to meet with foreign leaders without provoking World War Three. The notion that wars get started because of indiscretions in meeting with world leaders is a tactic that the foreign policy establishment relies upon to trick the public into never realizing who actually works overtime to involve the U.S. in global conflicts that do not actually have the U.S. public’s interest in mind: exactly the kinds of officials who signed the letter, and more specifically the organizations for which they work after having left public office. Considering President Eisenhower’s multiple threats to drop a nuclear weapon on the People’s Republic of China during the two Formosa Strait Crises, and Nixon’s “madman policy” of using “good cop” Henry Kissinger to negotiate a deal before foreign entities would have to deal with the “madman” Nixon, the establishment’s criticism of Trump’s intentional unpredictability rings hollow when one realizes that it is a tried and tested strategy of administrations past. According to these folks and their media lackeys, Trump and the public are both disastrously likely to break alliances and retreat into isolationism, and more likely to start another war at any time. It is an incoherent message from an entrenched group that despises even having to hock its lies to the public, and is disgusted by the public’s recent instinctual feeling that it is being lied to about foreign interventions in the same way it was lied to about the economic benefits of free trade. The establishment is content to continue throwing as much slime as it can toward Trump until something sticks. Past foreign service officers are aware that their voices carry little to no weight with the public in light of one failed intervention after another provoking skepticism amongst the public. Some of them have even expressed their understanding that the public is explicitly hostile to their message, since many of them rosily advised the public of the benefits of beginning the second Iraq War in 2003. It did not, however, prevent them from doing their own little part to signal to the potential Clinton administration that they are more than willing to “play ball” and scratch her back if she scratches theirs in the event of her electoral victory. A few talking points for us can be gleaned from this recent episode of “Ineffectual Letter 2: The Establishment Strikes Back.” The lazy, poorly constructed narrative of “Trump the madman” who will begin foreign wars by caprice conflicts directly with criticism of Trump as a man willing to pull back from foreign alliances and commitments if they do not serve the interests of Americans. His willingness to think more like Martin Dempsey, and less like Joseph Dunford, means a potential embrace of realism and understanding that we cannot will ideal governments in Russia or China into existence, but we can work with those governments to combat the coordination between radical Muslim elements Chechnya and Xinjiang with arms dealers in Libya and ISIS fighters in Syria. With them, and with the determination to do so, we can actually begin to combat ISIS with the intent of ending the Syrian Civil War instead of sidling up with ISIS to depose Assad for nefarious and shadowy reasons explained to the public as “his bombs dropped on ISIS are shaped too much like barrels for us not to destroy him.” In this way, the Middle East can stabilize, the U.S. can focus on fixing its long-neglected immigration and infrastructure problems, and foreign leaders can start taking a country that respects itself seriously as they see the benefits of avoiding the potential stick of protectionism contrast with the carrot of cooperation. Although Trump has offered rhetorical support for Israel, it does not appear to extend so far as to play footsies with ISIS to depose Assad for Israel, nor for Saudi Arabia or Turkey. Global unpopularity, theft of intellectual property, massive trade deficits, and espionage from Russia and China will certainly remain on schedule if the powers that got us into this mess are allowed to frighten the American public into more interventionism and goad them into another war with more hollow talk of democracy. “Standing up to Putin” as NATO advances closer and closer to the Russian Federation has not made the American people any safer, and likely support for the coup against Viktor Yanukovych made the region far less safe by prompting the Russian response to annex Crimea. If you are speaking to someone wary of being lied to about foreign adventurism, simply point out some of the top names who advocate for it, note how many of them are warning the public about Trump, and let people come to their own conclusions from the obvious implications of who is lining up behind Hillary. The disloyal but predictable shift of neoconservatives like Robert Kagan and William Kristol away from Trump and toward Hillary Clinton and independent candidates designed to stymie Trump can be an easily packaged talking point of our own to combat the enervated establishment’s flaccid warnings. Contra the advice of Richard Haass, America minding America’s business will neither destabilize the world nor “bring them here.” “Invade them, invite them” brings them here, and Trump represents the best shot at getting back to the traditional American policy of putting Americans first and letting foreign conflicts stay foreign conflicts. No more political correctness, no more billionaire bankers pretending to care about the social justice of women and minorities to mask their neoliberal schemes, no more wasteful defense contracts, ripoff alliances, and troops dying so insiders can remain insiders and international criminals can create “open societies” to plunder. This what Trump offers, and that’s why they hate him. This article is best viewed with the Coincidence Detector.